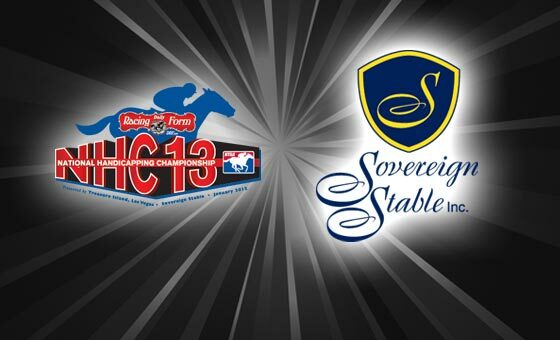 The drawback to being a weekend handicapper is that weekends often become filed with other activities and responsibilities, so I will not be able to make last-minute changes during Saturday's Sovereign Stables Online Handicapping Challenge. Top finisher gets a seat in the Vegas Championship in January, and winning the Power Ball lottery might be easier, anticipating 3,000 contestants (NHC Tour membership not needed). Arlington 8 (4:52 p.m.): #6 Suntracer (15-1) - The first of four Saturday races in the Public Handicapper contest is the Grade 1 Secretariat at 9 furlongs on turf. I cannot justify a 2-to-1 favorite (Treasure Beach) first try in the U.S. and am playing a hunch that Suntracer can sit behind a dawdling pace and perhaps outgun Willcox Inn to the finish. The horse also has three tries (two seconds) on the Arlington Park turf course and is second-best to Willcox in this field, in my opinion. Monmouth 10 (5:24 p.m.): #1 Strike the Moon (4-1) - The second of the PH.com events, the Grade 3 Monmouth Oaks looks wide open, but to me the Delaware Oaks effort by Moon was impressive vs. a nice horse in St. John's River, and the rail draw will prove a plus. I am expecting Moon to sit back a bit at the start (maybe 2-3 lengths) in a field with some serious early speed and make a run after the half-mile pole before taking this one home. #10 Dance Quietly (12-1) scares me a bit, but the outside draw was a turnoff for me. Arlington 9 (5:33 p.m.): #11 Never Retreat (10-1) - VERY bullish on the Bridgmohan-Block jockey-trainer combo and expect a nice stalking trip at a decent price in the Grade 1 Beverly D Stakes. I set #4 Upperline (20-1) and #5 Dubawi Heights (10-1) as backup selections on PH.com. Arlington 10 (6:15 p.m.): #2 Tajaaweed (12-1) - Hard to ignore Gio Ponti (2-1) and Cape Blanco (9-5) in the Grade 1 Arlington Million, but not going to win a contest picking $4 horses. Leaning toward James Graham and his course experience here and might have gone elsewhere had Mission Approved and Dean's Kitten not been part of the field. Banking on a pace meltdown and that Tajaaweed might catch lightning in a bottle and close this impressively deep field. Del Mar 5 (7 p.m.): #7 Dr. Green (20-1) - In my view, low-percentage jockey Kayla Stra is the only reason the morning line is so big here. Perhaps I'll be proved wrong, as I am at least 96% of the time in handicapping, but trainer James Cassidy is 23% first time off the claim, and this combo is winning at a respectable 10% on the turf in 52 starts. Dr. Green did not run a lick in the last three tries but, in my view, faced much tougher than many others in this field of 9 at a mile on turf. #1 Moment of Weakness and #9 Fifth Dimension will deservedly take a lot of money, but neither has yet to win on turf in a collective 12 tries. Maybe this is the 4% of the time where NJ Horseplayer is right. I'm hoping to return home from tonight's and tomorrow's family festivities to a DVR replete with a half-dozen winners and some place horses; wish me luck! want to wish you luck and success in the contest! May your next wager be a winning one! Dell, I'm not sure either of us had much success today; just watched the replays of my quick-trigger picks...0 for 10. NICE! Thanks for reading, and the kind words!